The red maples in bloom, February 9, 2014, Womack Creek, Tate’s Hell State Forest. This entry was posted in Tate's Hell State Forest, Womack Creek and tagged Tate's Hell State Forest, Womack Creek on February 10, 2014 by marylynanded. What more could a paddler ask for? A sunny Sunday, not even a breeze, temperatures in the 60’s, and hardly a current upstream and downstream. We put in at the Womack Creek Campground, our annual forestry pass posted on our dashboard, as we set off upstream on the Ochlockonee to Womack Creek. At put-in it was still a chilly 58 degrees, and the morning dew hung on spider webs lining the river bank. The small clouds parted to give us a full blue sky and warmth. More birds today than we have ever seen on the creek: a robin, a small red tinged warbler, the constant kingfisher, a great blue heron, a solitary duck which flew away to fast for us to identify, an anhinga with outspread wings, a cormorant. Past Nick’s Road primitive campsite, we paddled about 1 1/2 miles to a huge downed tree over the creek. Our saw, as sharp as it is, could not handle the job and we turned back, although we could have easily portaged and gone further upstream to where we had been told there is a beaver lodge. On the way upstream from Nick’s we saw a beautiful buzzard, wings outspread, head down — shot in flight we think. A fragile totem of life and death in the forests, but this one an unnatural death. We stopped for a quick lunch at Nick’s Road Primitive Camp Site, one of the nicest primitive camp sites in Tate’s Hell. Gold finches downstream, a pair of another species of duck and a hawk which we have seen before in this section, it’s sharp cry warning us of its presence. The hoot of the barred owl somewhere in the forest — a sound which can lull one to sleep while camping here. For the first time in the 3 years we have been paddling this creek, a doe — a quick meeting of eyes and she bounded away. Turtles, the larger ones, catching the warmth of the day, hesitating to drop into the water as we try to paddle as unobtrusively as we can. So much life on this creek. 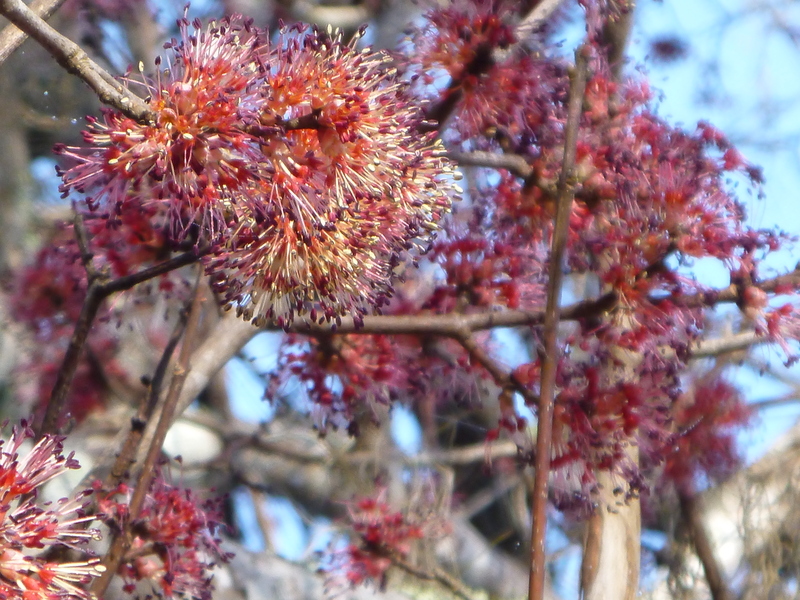 We were elated to find the Florida red maples in bloom — we have been trying to get a photograph of that flower for years. They were beautiful, closeup and the full tree. Blueberry blossoms which had already started blooming in mid January seemed not to have been killed by last week’s killing frost — a bountiful crop in early summer. Usually at this time the ash are beginning to bud; not this time. Only the alder catkins and on the upper 1/3 of the creek the Walters viburnum are beginning to bloom — its white flowers a harbinger of spring. There were 3 jon boats of fishermen, quietly fishing, as they usually do, along the banks. On the way downstream one fisherman was hauling in a mud fish. When we paddle during the week we are usually the only ones on that creek, but these Sunday fishermen were so quiet that one didn’t notice them until they were within clear sight. They were enjoying the day as much as we were. The stand of green fly orchids, a threatened species, was no longer there — the bark of the dead tree on which they were growing was completely striped. But we found another stand and for the first time on Womack Creek, Bartram’s airplant, a bromeliad which can be found on the tributaries of the Apalachicola. The only mechanical sounds we heard was one small plane whose drone of motor was barely noticeable and when we reached the take-out, the sound of a fishing boat engine. At take out, looking overhead, a single egret silhouetted against the still blue sky. 10.3 miles of great paddling on a lovely creek, ready to burst forth in a month with buds and flowers. But we could not have asked for a better day and creekside all was right with the world, even the unfortunate death of the buzzard. We are so thankful for such a place. This entry was posted in Uncategorized on February 10, 2014 by marylynanded. 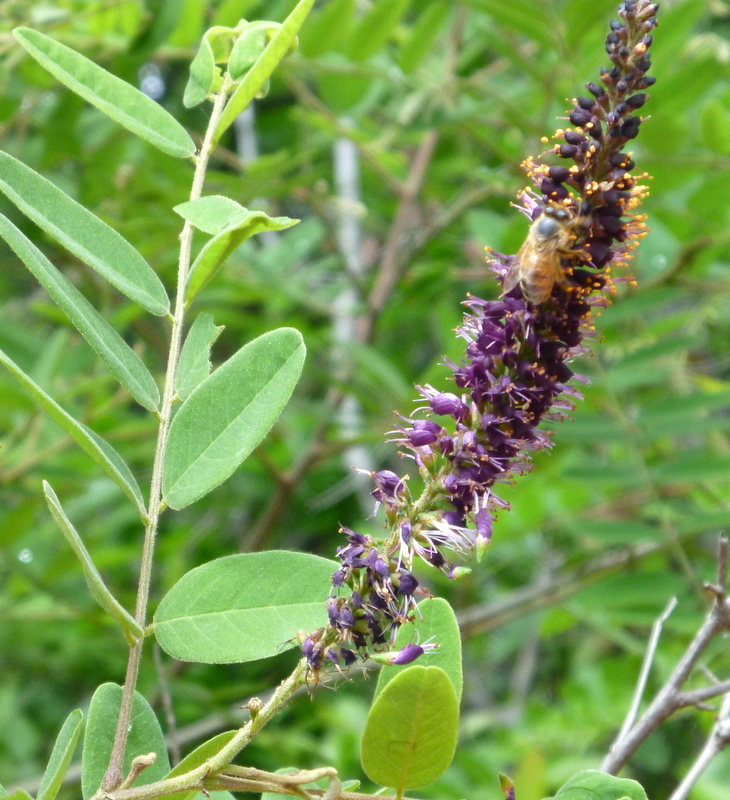 This entry was posted in Insects, Native Wildflowers, Tate's Hell State Forest, Tate's Hell wildflowers, Womack Creek and tagged Florida insects, Florida native wildflowers, Paddling Tate's Hell State Forest, Tate's Hell State Forest, Womack Creek on February 6, 2014 by marylynanded.